The color orange tends to have a special meaning when it comes to looped ribbons which are traditionally used for showing support to a particular cause, or to raise awareness about a particular disease. Orange ribbons are generally worn to raise awareness about kidney cancer, hunger, Prader-Willi Syndrome, leukemia, humane treatment of animals and multiple sclerosis. 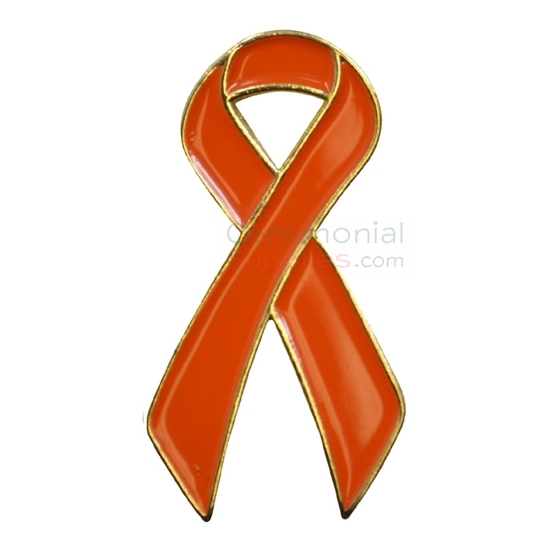 The Orange Cause Lapel Pin is an excellent alternative to a full orange ribbon. With its diminutive but highly visible design, this pin can be worn to show that people who battle one of the aforementioned that they are not alone. CeremonialSupplies.com has a dedicated section of support ribbon pins to pair up with ceremonial keepsakes and gifts for ribbon cuttings and groundbreakings. Please our store to choose the pin most suited to your cause.